I deal with the story of Kukulkan and the feathered serpent in a seperate page. 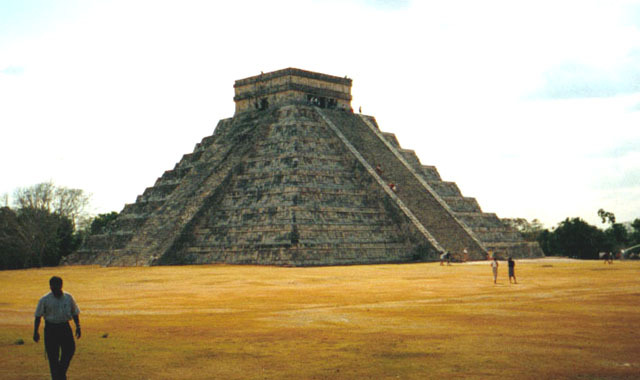 But the story is intertwined closely with Chichen Itza. 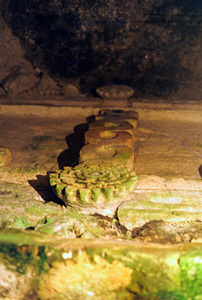 To read more about the feathered serpent and Kukulkan, please go to my Mystery of the Feathered Serpent page. 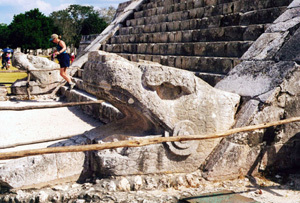 There you will see why it was called the Feathered Serpent. For now just so much: The legend of Kukulkan says that a god came as a feathered serpent from the sky, brought knowledge and wisdom to the Maya and left again with the feathered serpent to the sky. At first I would like to explain how the pyramid is laid out. The pyramid is 30m high. 24m for the main pyramid, 6m for the temple on top of the pyramid. The base of the pyramid is 55.3m at each side. 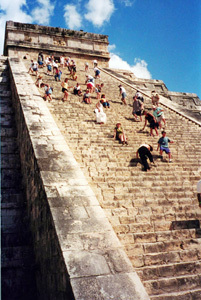 Each of the 4 sides of the pyramid features 91 steps to the top. 91x4=364 + 1 step on top for the temple = 365 steps. Exactly the days in a calendar year. This feature by itself would be a great achievement from the builders that already shows great astronomical knowledge. But this building holds more surprises that are even more incredible. 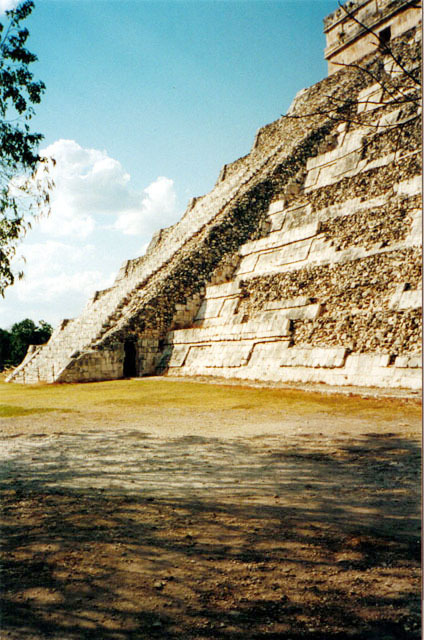 This panorama image taken in 2000 shows the Pyramid of Kukulkan (El Castillo) and the Warrior Temple behind it. 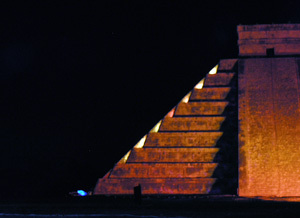 Only two of the four sides of the pyramid are completely restored. The other two sides are left unrestored. This shows nicely waht state the pyramid was before the 1920s. The photo on the left and one below show those unrestored sides that are not photographed very often..
A closer look at the unrestored part of the pyramid. A side effect of all the astronomical features expained below is that the steps are extraordinarily steep. At the bottom of the stairway you will find two snake heads. Please read on to find out why they are there. You have to note that the snake heads are only on one side of the pyramid. 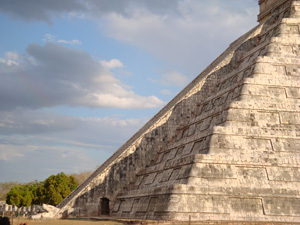 As the sun rises the optical illusion makes it look like the snake of light and shadow crawls down the pyramid just like the legend of Kukulkan says. 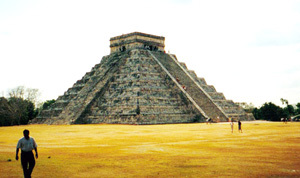 During the Autumn equinox the spectacle is reversed and it looks like the snake crawls up the pyramid to the sky. I'm currently working on a 3D computer simulation of the effect, but I'm not a wiz with 3D programs. Please be patient and check back. If you want to see a simulation of the effect in person and you can't make it during the equinoxes, I recommend visiting the after hours light show. Here the effect is made visible with spotlights. 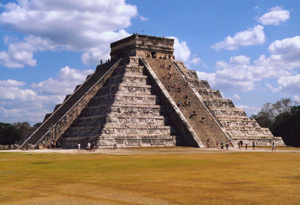 Along with the restauration of the pyramid in the 1930s excavations took place. During those excavations it was discovered that the Pyramid as we see it today was built over an older pyramid. This is not unusual for Mayan buildings. 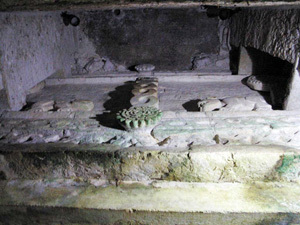 The unusual part was that a tunnel leading to an intact staircase inside the pyramid was found. 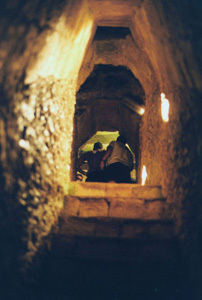 Those stairs lead to an intact room that was once the top of the older pyramid. The Mayan architects designed the newer pyramid specifically so this staircase and room from the older pyramid stayed intact, without being accessable. One could get the impression that they wanted to preserve a secret or message of some kind from their ancestors. 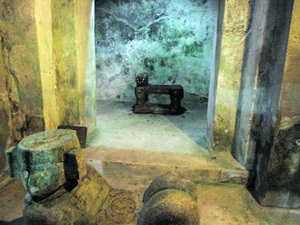 The photo on the left shows the entrance to the hidden starcase that was carved out in the 1930s. Back in 2005 when this photo was taken it was still possible to enter the hidden passage and the room on top every hour or so. Now this area is closed to the public, unfortunately. The staircase and the room are extremely dark and flash photography was not allowed. The staircase and the room are extremely dark and flash photography was not allowed. My photography equipment at the time was not as suited for low light photography as it is today, so the images are not as crisp as they should be. But they still show the important things. 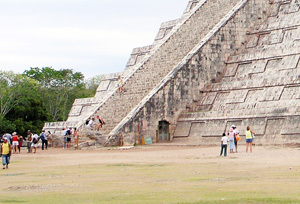 On the left you see the inside of the pyramid with it's hidden staircase. The stairs are basically the outside stairs of the older pyramid left intact by the builders of the current pyramid. The stairs are extremely steep. Inside the hallway are steamy temperatures. My handheld thermometer registered 48 degrees Celsius. The humidy was very high and you arrive at the top trenched in your own sweat. "I'm sorry to drip on you" another guy said to me :). Here in almost complete darkness you can only vaguely make out that there are carvings on top of the room with the Jaguar. What looks well lit here in the photo is due to the fact that I made a 2 second exposure with the camera with it's aperture wide open. With this exposure setting the camera can see more then the naked eye. Please note that I have not found any other photograph of this carving anywhere on the internet. Nobody seems to notice this important carving. Now we can see two Jaguar carvings, both facing inwards to a tall carving in the middle. I would like to point your attention to the carving in the middle. Closest to the camera is a round object which looks a bit like a flower. The carving on top of this object is what I think is sensational. Let's look at this a bit closer. But on to the carving: You can clearly see that above the flower like carving is something like two figure 8 on top of each other. This symbol is the central symbol of the old pyramid as the two Jaguar figures on each side are telling us. I visited many other ruins and pyramids in Mexico, I have never come across a similar carving. If you have, please let me know, I would be very interested to find out more. 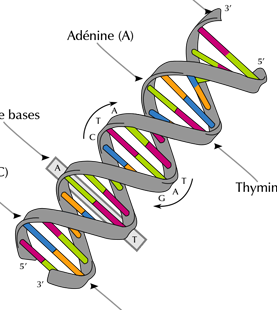 In my opinion the blooming flower underneath (and above if you look closely) the DNA symbolizes life, which is a great way to describe it.